We have been asked a few questions about our CSA vegetable box program – and how it differs to some of the other vegetable box programs. All the food in our box is grown on our farm – it is seasonal, local food – picked within 24 hours of your pick up. The food has not been transported from farmers across Australia (and abroad) to central markets where it is then boxed again and sent off to households wanting fresh organic produce. As a culture, we are losing our connection to the cycles of the seasons. CSAs offer us the ability to return to a seasonal diet. At Transition Farm we grow particular crops that are appropriate for the current season in this region. Often, the biggest difficulty with eating seasonally is that our shopping and cooking practices mirror more chemically and genetically modified produce that is found in the grocery stores (which travel thousands of miles before ending up on your plate), than it does what is available in the local farm during that season. "Based on my experience with Forest Eve Farm, I would highly recommend participating in Community Supported Agriculture. Unlike just “buying” food from the supermarket, by having a CSA share I had a vested interest in the success of a farm and was proud to be a part of a community of people that had come together to help feed one another. Each week I was pleasantly surprised by how much food my share yielded! As a result, I had the pleasure of sharing many meals with grateful friends thanks to the hard work of the farmers of Forest Eve Farm." -Ryan 2010 CSA Member, Burlington. We are currently harvesting asparagus, artichokes, beet root, bok choy, broccoli, cauliflower, fennel, lettuce and assorted tender greens, kale, pak choy, silver beet, and spinach- and still enjoying the very last of the over wintered carrots, leeks, lemons and pumpkin. Mixed with herbs like borage, calendula, chervil, chives, coriander, dill, mint, nettles, parsley, tarragon and thyme, the recipes are wonderful! Seasonal, local cuisine includes leek, fennel, lemon and asparagus risotto flavoured with lemon thyme; mixed herb and lettuce salad with sprouted fenugreek; steamed artichokes with a tarragon dipping sauce; spinach soup; spring stir fries; Main Ridge goat's cheese and nettle spanakopita; leek, carrot, asparagus and thyme tart...just to mention some of the delights we have been cooking. We will be seeding the cucumbers, squashes, pumpkins and remaining root vegetables for the summer share in the coming weeks. Another advantage of being part of a CSA is having your say in what we grow. 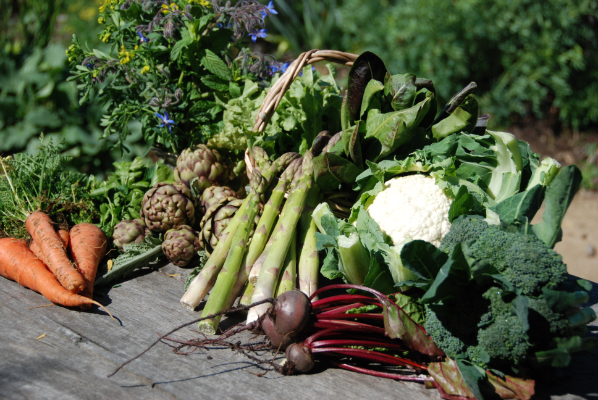 If there are vegetables and herbs that you would like to see in your summer box, please let us know now. And as the sun crosses the equator heading south, Happy Spring...happy planting!